On Friday 27th May, you may remember, TfL launched a new tube map. Transport for London (TfL)'s latest Tube map is to include the Capital's tram services for the first time. The addition is designed to make it easier for those travelling to Wimbledon, Croydon or Beckenham to plan their journeys. It had trams. Unfortunately it also had Morden in the wrong fare zone. Nobody spotted that Morden was in the tram zone before the tube map went to print. Thankfully they did spot the erroneous National Rail symbol at Mitcham, and shifted it to Mitcham Junction instead, before pressing the button. But Morden slipped through, onto hundreds of poster maps destined for station walls, and millions of paper maps destined for ticket hall racks. It was an expensive blunder. TfL's plan had been to start distributing the new maps in the week ending Friday 3rd June. Normally they don't reveal their launch schedule in advance but this time, because of the big tram reveal, they did. Customers will begin to see the latest Tube map in stations throughout the next week, and it will be available to view online, along with other transport maps produced by TfL, at www.tfl.gov.uk/maps from 3 June 2016. Once the new map had been released to the media, it didn't take long before eagle-eyed readers spotted the Morden blunder. Ouch. It wasn't hard to amend the error on the digital map, and the corrected version appeared on the TfL website from Friday 3rd June as planned. But as for the paper version, TfL suddenly had millions of incorrectly printed tube maps on their hands. A brand new print run had to be paid for, and the intended launch date was silently postponed. 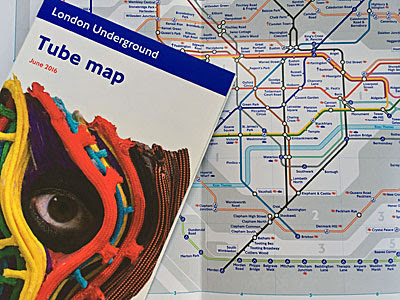 Boxes of the new June 2016 tube maps had already been sent to stations at this point, ready for wider distribution, but now they had to be recalled. Except at High Street Kensington, it seems, where staff accidentally put them out on display in the racks, and dished them out to passing tourists by the ticket gates. And those incorrect maps carried on being available for over a fortnight before somebody eventually noticed. Finally yesterday, a couple of weeks later than intended, corrected reprinted versions of the new June 2016 tube map started to appear at tube stations. They're going up in poster frames on platforms, and they're starting to be available for passengers to take away, as of this weekend. 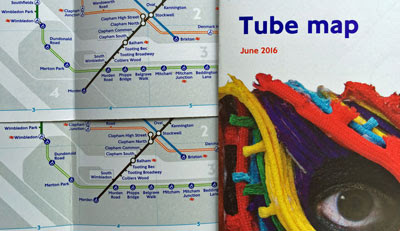 Which means there are now two different versions of the June 2016 paper tube map - one an updated reprint of the other. Both versions have a threaded eye on the front cover, both versions have trams, and both versions have a dotted line to represent major engineering work on the London Overground. But the first version had Morden in the wrong fare zone, and the new version places it properly in zone 4. 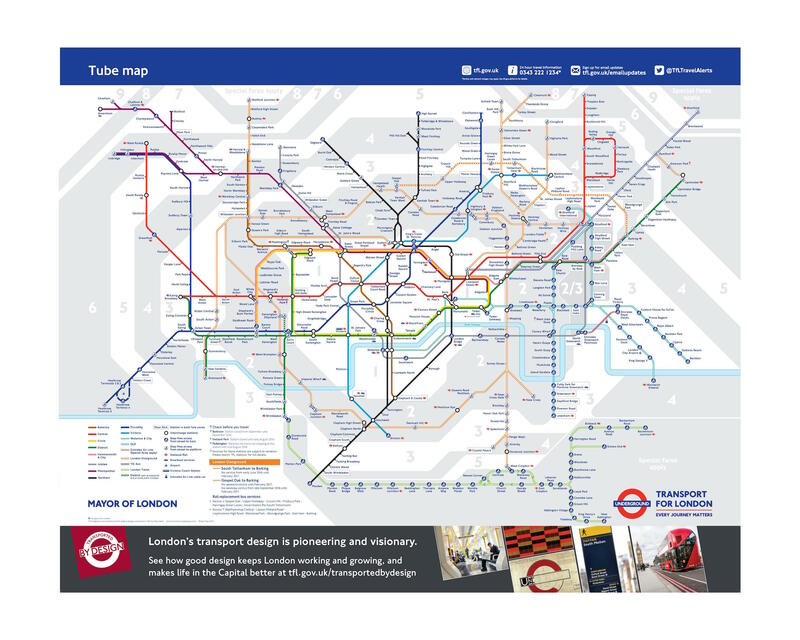 It's embarrassing for TfL to have made so public a mistake, especially on a map which declares itself on the back cover to be "one of the most iconic designs in transport". It's unhelpful to have delayed publication, because for the last two weeks Overground customers have been seeing out of date maps which didn't show their line has been closed. And it's an expensive error, because to print a half-year supply of 12 million tube maps costs TfL £100000, and they've just been forced to reprint an entire delivery. Fortunately for TfL, nobody in the wider world has noticed their mistake. Normally the media go wild for tube map news stories - you only have to fire a press release with a tweaked tube map at them and they publish it with glee. But as for the official tube map having been printed with an actual error on it, and then reprinted (at a cost to Londoners), it seems this isn't news. So that's a bullet dodged.